paulo da costa is concerned with the passage of time and its effects on generational attitudes and memories. 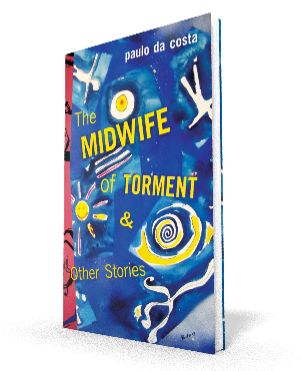 Da costa’s writing is recondite, preferring a lyrical, almost poetic style of narration. The stories in The Green and Purple Skin of the World (Freehand Books, 206 pp; $21.95) have an unhurried, meditative aspect that suits the material, but can also be wearisome over the course of an entire collection. The Table is typical of many of the stories in the book. Not much happens on the level of plot; the author is more concerned with dissecting the relationship between a mother and her son, and using that relationship to examine the way the past intrudes upon and influences the present. The son, who refers to himself as “the guardian angel,” has brought his mother (who refers to him as “the pest”) a new IKEA table for her kitchen. The mother’s old table is scarred and battered, and the son feels that it is time to replace it. His mother, however, thinks the old table is just fine, and can’t believe her son would want to substitute a factory-made piece of furniture devoid of character or history. The clash of tradition and modernity is fairly obvious, but da costa handles it with admirable subtlety, infusing what could have been a clichéd situation with a surprising poignancy. Other virtually plotless stories address similar material, but with less emotional resonance. The opener, Flies, features two pairs of males — an older couple and their grandsons — eyeing each other suspiciously from opposite sides of a street, and making somewhat tepid observations about the folly of youth on the one hand, and the decrepitude of age on the other. In Another Sunday, a young boy displays abject disinterest in his father’s heartbreak at his favourite soccer team’s championship loss. Not all of the stories in the collection are told in such a languid manner. The title story is epistolary; Those Who Follow is told from the alternating perspective of a hunter and the cougar he is stalking; and there are even a couple of speculative fictions. Not Written in Pencil eschews a lyrical approach in favour of a first-person narration by a working-class tough who takes his frustrations with his philandering wife out on an unfortunate interloper in a bar. But the narration here feels affected and forced — “This little incident with Cody tipped her over the punchline”; “enlightenment is a damn fancy-schmancy destination” — it never sounds authentic. Much better is the alternating perspective in My Real Mother Would Never, told, respectively, from the point of view of a young girl who has run away from home and her mother, who is frantically searching for her. The mother’s sense of helplessness is palpable; she is reduced to a kind of child herself when she calls her own mother for advice about her missing daughter. The girl, meanwhile, is driven by a sense of betrayal at the news that her mother’s new boyfriend is moving in with them; this treacherous emotional territory is traversed sensitively and with an indirection that is admirable, and helps elevate the material and earn the uplift in the story’s happy ending. Steven W. Beattie’s Shortcuts column appears monthly. This entry was posted in Blog, Reviews, Reviews - G&P and tagged reviews. Bookmark the permalink. The review of Paulo da Costa’s collection, The Green and Purple Skin of the World, by Steven W. Beattie in the National Post does not do justice to the quality of the author’s work. It appears that the reviewer cannot understand or sufficiently appreciate the power of poetry, lyricism and the multiple insights revealed in the stories. “The Table,” for instance, is a beautiful and fulfilling story, ridden with socio-political and cultural specific meanings, relative to Portugal (i.e., colonial war in Africa, deep family connections, communal life styles) revealed through detailed, slow and poetic strategies, with an unexpected, powerful and climactic end, which the reviewer failed to grasp. Should the reviewer of literature in this column not have the obligation to actually understand the context of what he is critiquing? On the other hand, the story “My Real Mother Would Never,” which presents a more “Canadian” (I ask you to read between the lines here) cultural scene and prosaic storyline, is described by the reviewer as the more accomplished one. I suspect that’s because the reviewer felt more at home and could understand what was going on. But again, the reviewer must do his homework and step outside himself so that he can really do justice to what he is critiquing—because his words do, after all, impact those who read them and may not know differently. This very story also offers a critique of the Canadian culture of silence, of people not wanting to hear negative things or complaints or talk about problems openly, as if everything is supposed to be always okay, which I, as someone who is a “dashed” Canadian, can understand and in fact have problems handling sometimes or accepting as healthy. The author is doing that perhaps to show another way of being, another way of life, just as there is another way of writing (his way of writing)… Is Canada not a diverse country? How do we value that diversity? Or do we really value it? It seems that the reviewer’s definition of literature and its very task is narrow and parochial: has he been affected by capitalism to the extent that he can no longer see outside its tricky and thick belly? You know, if we read literature from other countries, excellent literature by the way, literature in several languages that has won Nobel Prizes, we will note that literary fiction is supposed to be lyric, poetic and conducive to deep complex thinking and reflection, not mere superficial entertainment or fast food for the car racers of today. If Canadian literature is to become better and widen its horizons, it needs to value writing that is diverse and which follows a more lyrical, poetic and philosophical inquisitive line rather than being spiritually sterile and overly rationalistic, as I find often to be the case in this beautiful and diverse country of ours. If I want a merely descriptive, rationalistic storyline, neat and depleted of metaphor and lyricism, I will read a scientific or newspaper article, where language is controlled, contrite, uni-dimensional and aims at a single, uncomplicated truth that sees logic as the intelligence par excellence. What is the point of writing literary fiction if not to make us slow down, experience the beauty of language, poetry, spiritual and non-rational insights—insights that fall outside of the paradigm of rationality and which offer a much more holistic and complete human experience? If I want merely plot, action and sheer thoughtless art and indulgence, I will watch a gun-shooting Hollywood film—the trend du jour that invades me constantly even in my most recondite moments of the day that are meant to be lived in silence. Let us be quiet and in awe for a moment. Let us revel in that space that cannot be measured, encapsulated and defined, for it may be there that we fully exist and find the strength and illumination to become happier and better human beings—better towards ourselves and the world around us. What we may need more of, in these days of ours, is writing that makes us stop and ponder upon things, writing that goes beyond what we are, writing that questions and searches, not writing that merely indulges, reaffirms and is content with what, who and where we are or makes us laugh and think fast because we have more than enough speed in our world, in our life. And this is what and how I think—and write.